Here’s a protip for broadcast reporters who might get arrested: Turn on your recording device’s key lock, so that when the cops tackle you, it won’t matter if the stop button gets mashed. You’re going to want that tape. That is one of many lessons that Ryan Kailath learned this past weekend — the hard way. 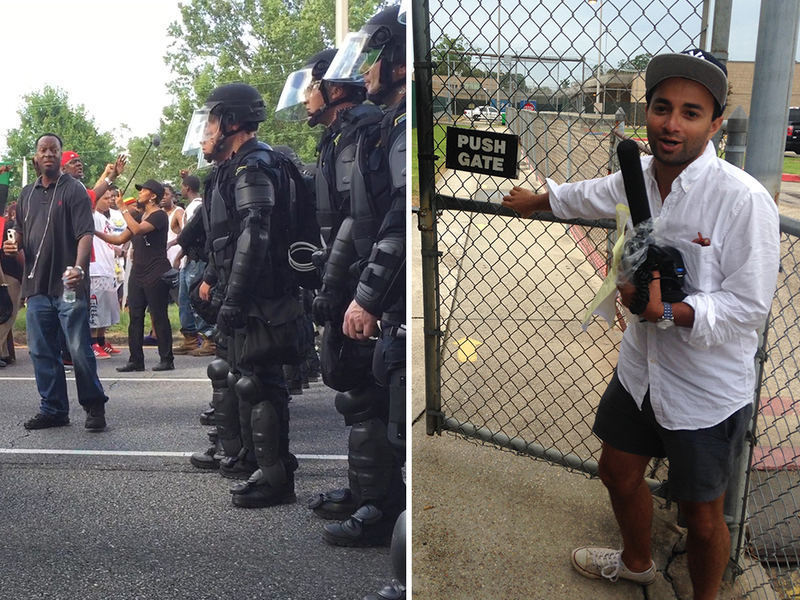 The reporter for WWNO in New Orleans was covering an anti–police brutality march in Baton Rouge on Saturday when police arrested him for obstructing a highway. As you can plainly see in the video he took of the incident, Kailath had not set foot in the road. Kailath spent about the next 24 hours in the hospitality of Louisiana authorities, which involved performing a naked squat-and-cough, among other memorable moments. This week on The Pub, Kailath tells his story, shares other tips he picked up for reporters who might find themselves in a similar pickle, and talks about where his case stands. Also, I offer some updates — and some mea culpas — on last episode’s interview with Code Switch leader Alicia Montgomery, which at least one listener found troubling. Other stations can learn from KPLU’s shockingly successful bid for independence. Probably will be dismissed as the remarks of a troll, but I’ll make a few remarks anyway before I give up on attempting to advance ideas here. I don’t think it’s racially insensitive to criticize the new Code Switch podcast for sounding like every other NPR podcast. The whole point of Code Switch is to represent a certain difference, and it’s fair comment to point out it doesn’t do that with its sound. Doesn’t bother me, but then I’m not wild about the whole idea of one special team to represent only a certain kind of difference. The response that the criticism doesn’t take adequate stock of how hard it is to work as a minority at NPR shows part of the problem with Code Switch. NPR, it seems to me, is stretching to coddle minorities, particularly in the very existence of Code Switch. That a Code Switch team member appears to feel oppressed even in that context suggests to me an inability to see beyond the typical liberal tropes of the minority experience. I suppose that’s all some people want out of Code Switch. I find it dull and, over time, tedious. What you did in the interview last week was the opposite of racially insensitive. It was racially hypersensitive, to the point of undermining the interview entirely at some points, as you seem to admit in part. But I already complained about that last week. I don’t think it does Code Switch members any favors to treat them like they’re made of glass. But it appears at least Code Switch team member disagrees with me. Sonari is not on the Code Switch team. As I said, he’s a reporter on the business desk. Thanks for the correction, but didn’t you also say he has done work for Code Switch? Maybe I misheard you. In any case, it doesn’t really affect my points, to the extent his view is representative of Code Switch, as you seem to treat it as. You have pointed out the issue of liberal bias in public radio, and that increasing the representation of minorities at NPR is bound to exacerbate it there, but you treat direct criticism of Code Switch on that basis and related bases as the work of internet trolls. I’m still baffled by this. Your mea culpas don’t resolve it. My mea cuplas weren’t directed at you — I’m not apologizing to you. NPR’s problem with liberal bias is indeed, in effect, exacerbated by its efforts at diversification, of which Code Switch is representative. That’s not a reason to not do Code Switch, nor is it a reasons to not hire/retain more people of color. It’s a reason to stop hiring so many white liberals. I believe that many of the white criticisms of Code Switch I see constitute trolling, and I’m not backing off of that characterization. I see. It remains that you treated the complaint as representative of Code Switch (and I see Glinton had a piece for Code Switch this week). The primary point isn’t to apologize but to make sense. That trolls have taken up a position doesn’t imply it isn’t also the position of perfectly reasonable people, like yourself, whom you nonetheless dismissively mashed all together as trolls. It illegitimately undercuts legitimate criticism to present it that way. And it and other undercutting prevented your interview from taking serious points seriously. There are legitmate grounds to question the very idea of Code Switch at NPR, given the lack of similar privilege for any other underrepresented points of view. But the larger point that got buried without serious treatment was that of liberal bias, more clear and permitted at Code Switch than any other part of NPR. I doubt you disagree, as you called attention to the more opinionated style for Code Switch, but you didn’t in any serious way explain or press the point of bias where it most clearly applies. No, I did not treat Glinton’s complaint as being representative of Code Switch. I treated it as being representative of Sonari Glinton, an individual human being. Between his feedback and my own retrospective thinking, I decided I had done a couple things wrong. So I wrote about them. I don’t have any problem with Code Switch’s liberal bias within the unit that is Code Switch. Maybe you do, but I don’t. If you want to bring your complaints to the team, get your own show. You made it appear Glinton’s remarks were the basis for your apology to Code Switch. That would imply you took what he said to be representative of their situation. Quibbles aside, my points above still apply. Whether you agree with them or not, you misrepresented serious, reasonable objections to Code Switch, and it prevented serious consideration of them. It remains unclear to me from your remarks here and elsewhere why objectivity isn’t as good and important a functional standard for journalism as truth, fairness and so on. All standards relating to reality are subject to the very same kinds of disagreements, including disagreements among groups. My suspicion is that you’re responding to conflicting impulses typical among liberal intellectuals. On the one hand, liberals want to see themselves as objectively right, and criticize some groups as objectively wrong. On the other hand, they’re anxious to recognize the differences among people and, especially, certain groups, to the point sometimes of implying some or other kind of subjectivism. It’s tricky to work that out, but any abandonment of objectivity as a crucial goal is bound to be impractical and cause confusion. I think you are confusing the issue, Kent. Facts are objective. But which facts/arguments are important for journalists to highlight is entirely subjective. The overwhelming majority of climate scientists believe that the planet is warming and human activity is a significant factor. Their opinion is based on learned examination of empirical evidence. This is a fact. And “liberal intellectuals” are rightfully exasperated that many people still live in denial of that objective truth. What is subjective is what we should DO with knowledge of that fact. “Liberal intellectuals” tend to take for granted that idea that government regulation of CO2 is the obvious and only course of action. When public radio shows talk about the issue, they rarely think to include a person who would argue that warming is an acceptable cost of economic growth, and that the better responses would be adaptation and/or geo-engineering. That kind of subjectivity is precisely why I have argued, many times, that public media and journalism in general needs to actively recruit conservatives. The fact that so many conservatives embrace and perpetuate objective untruths makes that hard, though. I can’t tell which part of what I said you’re taking issue with, as you don’t seem to contradict it. What you say appears to show why the concept of objectivity is essential as a functional guide for journalists. In deciding what the facts are, they must strive for it. That effort includes recognizing what isn’t objective, including value judgments (or at least controversial ones). That many liberal intellectuals (and others of course) don’t do that well in regard to how climate change should be dealt with doesn’t make the effort any less important. I agree public radio fails in the way you describe. It’s in part a failure of objectivity, confusing value-driven judgments for objective facts. It’s the opposite of a reason to abandon objectivity as a functional standard. There are sufficiently objective ways for journalists to make judgments about what should be covered. They need to consider which value judgments that would shape coverage are shared among the target audience, and which aren’t. That’s an objective matter. Their news judgments should be guided by the shared values. In addition, there should be some room for coverage around values not shared, in the form of commentary or coverage of controversial views. How much such coverage there should be should depend on incidence among the target audience, current importance, potential importance, and other things for which there are some objective, if sometimes diffuse, indicators. We agree that ideological diversity would help with all of this. There’s irony in the fact that you take as your example a liberal failure of objectivity (though you seem not to view it that way) and then imply there’s a special problem with hiring conservatives because they believe things that are objectively wrong. I think you overestimate the differences between conservatives and liberals in that regard. Please read again, more carefully. OK. Now what? I still can’t tell what points I’ve made, including in what you quote, that you’re taking issue with. The notion that you seem not to take the liberal failure as a failure of objectivity? That’s a result of trying to make sense of your objection to objectivity as a functional standard in such a case. The hypothetical example I spelled out was clearly a liberal failure. Explicitly. I came out and said it, I have no idea why you’re confused. To your broader point, the issue is that actual objectivity only covers a tiny percentage of the decisions that journalists have to make every day. Only facts are objectively true or not. Your facts should be ironclad even if you’re writing an opinion piece. All of the other things that reporters do for a living — deciding which facts to pursue, which ones to include, which perspectives to include, how you present them — have nothing to do with objectivity. They are all judgment calls. Objectivity is not a functional standard by which to judge these things that are inherently subjective. There is no objective balance. There is no objective fairness. Those all depend on point of view. I think there has to be another way — something between the old school, bogus concept of objectivity and the new school “anything goes” mentality. I’m spending my summer writing, trying to figure it out. No confusion about that, just an ambiguous remark that you took in a way I didn’t intend. I wasn’t questioning whether you thought it was a liberal failure, only whether you thought it was a failure of objectivity. It still appears you don’t, that you think the standard of objectivity doesn’t apply in that case. I explained how it does. I don’t think the objections you make show the old-school standard of objectivity is bogus. I don’t see anything in your objections that can’t be adequately dealt with in terms of shared values and objective facts. That appears to be the heart of the disagreement here. I argued above that there are sufficiently objective ways for journalists to make judgments about what should be covered, and the same is true of fairness and so on. There are shared notions of fairness to rely on, the achievement of which is generally an objective matter. It can be determined objectively how much time each side has received, whether a position has been correctly represented, and even matters such as tone can often be objectively compared. There can be complications and vagueness, but that’s not the same thing as not being objective.